Hans Georg is a small 2-way-shelf-speaker. 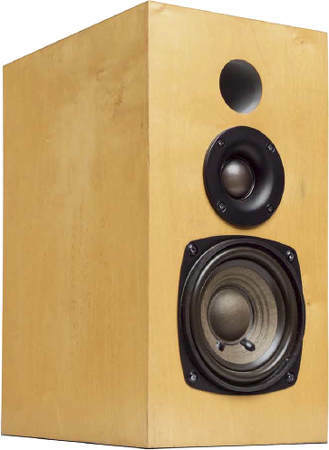 It is a reasonably priced loudspeaker with Monacor drivers developed by Hans Georg Lahr. Hint: If you use the delivered bass reflex tube the housing needs a bigger cut-out than marked in the plan. Our high-end version employs a Mundorf baked varnish air core coil in series to the woofer. In series to the tweeter a Audaphon MKP capacitor is used. Elsewhere only polyester capacitors are used instead of electrolyt capacitors.